12 miles of some of the best singletrack in Alabama. Located on the shores of Lake Jordan complete with roots, rocks and rolling hills. Home to the annual Coosa River Challenge Adventure Race. 12 miles - Varying trail difficulties from beginner to advanced. 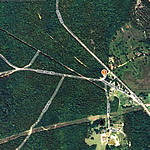 Hwy 231 N. from Wetumpka, 3.5 miles north of Hwy 14 Junction look for sign where road changes from 2 lanes to one. Yes - Basic info board with map. Primitive changing room, covered pavilion at trailhead, bike wash hose. Swayback Bridge Trail 2.5 Mile Loop (Green Trail) "